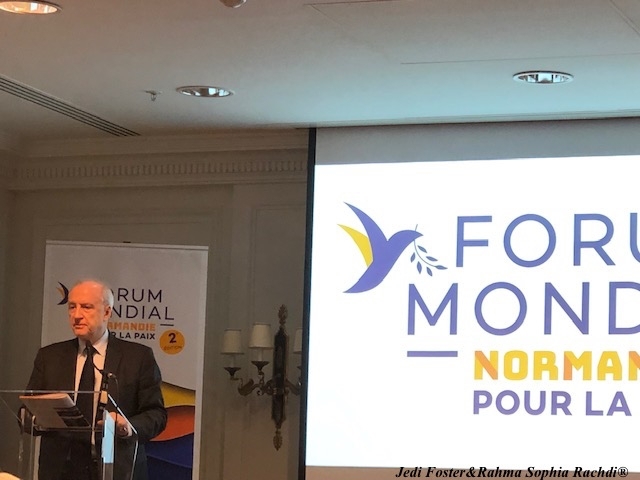 USPA NEWS - The President of the Normandy Region, Herve Morin, made the introduction of the press conference in front of thirty journalists to announce the future Peace Summit Normandy, which will take place on June 4-5, in Caen, for its second edition "Our event is gaining momentum. Other distinguished speakers are Hubert Vedrine, former Minister of Foreign Affairs, Bertrand Badie, Poltical Scientist and professor at Science PO, Francis Xavier Priollaud, VP Region Normandy, YAK, aka Yacine Ait Kaci. His character, Elyx, has a little stick figure, shares his sunny disposition on social media. He became the first virtual ambassador to the United Nations in 2015. 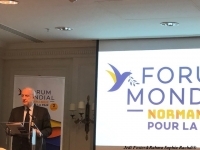 The second edition of the World Normandy Forum for Peace will be held on June 4 and 5, 2019 in Caen, at Abbaye-aux-Dames, before the commemorations of the 75th anniversary of the D-Day landings on June 6, 1944 and the Battle of Normandy.The 2019 World Forum will offer, around the theme "Peace Makers", conferences, thematic debates, a Village for Peace and highlights dedicated to youth, around internationally renowned personalities including 5 Nobel Peace Prize winners. HERVE MORIN PRESIDENT OF THE REGION NORMANDIE UNVEILS THE GLOBAL WALK UNIVERSITY PROGRAM TO BE LAUNCHED BY WNFP----------------------------------------------------------------------------------------------- "We want to make it a mediation space and a chair at the University of Caen next September because we need to associate youth, or to create the" LIBERTY AWARD "and sign a teaching program entitled" GLOBAL WALK ", with the EU and the ability to bring together all subjects from around the world. Fifty nationalities will be present at this second edition, including seventy ten think thank, and partnerships on the theme of the scientific city has apple PEACE MAKERS.------------------------ Herve Morin insists on the importance of the "Role of NGOs, peace, or the presence of international groups, on war and peace, and the public appeal of four major Nobel laureates, who write a manifesto ... 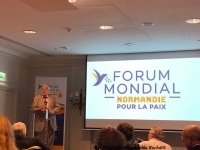 Hence the Measurement of the conflicting impact of the world with the PEACE INDEX of NORMANDY, and the PEACE Award, elected by digital election ", IL adds that" We associate ourselves with Jean Pierre Raffarin (Former Prime Minister ) who decided to make the Peace Forum showcase his commitment to Peace, through his foundation LEADERS FOR PEACE. " 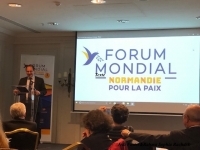 The President of the Normandy Region, invited on the 3 highlights of the Peace Forum, June 4-5, Caen, which provides for at least five thousand participants of the first edition 2018: 1- Ukraine 2- Colombia 3- The Young Leaders of Peace Herve Morin, concludes his intervention by revealing an original event, which consists of a friendly football game because it is composed of a team of Colombians, mainly ex FARC members and victims of the FARC, against a team of footballers from the city ​​of Bayeux, Normandy. 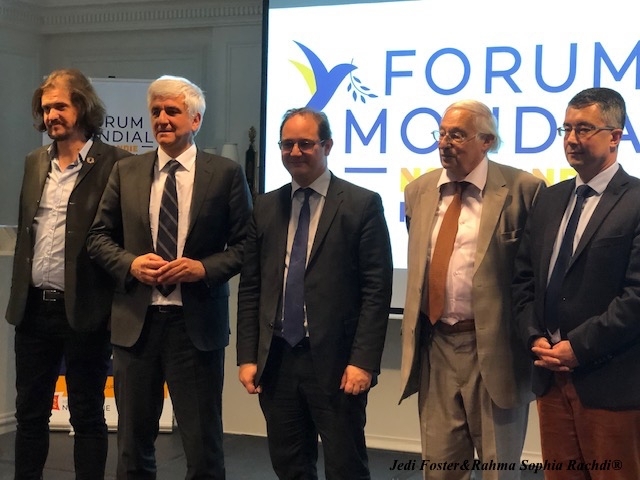 This match has a strong symbolic value, and as Herve Morin said, "The goal is to open the debate to the wider for reasons of stability and peace and we are making it a future annual event. must-see, like the Davos of Peace » "PEACE CANNOT BE IMPOSED IT HAS TO BUILT » EXPLAINS HUBERT VEDRINE Hubert VEDRINE explained how he envisages the process of peace and especially the means proposed to maintain its longevity: What leads to peace and to maintain it and the repair is weak and often advises emotionally and morally and I find it interesting the Morin's intuitive on the theme of peace makers. It is not obvious, there is a REAL subject and it is necessary to make an effort of vocabulary, and one can not impose the peace, it is necessary to build it and how to do it in truth. Some are installed in an economic logic of running away and if this initiative becomes the laboratory of operational things on how to build peace "The former Minister of Foreign Affairs concluded his intervention by distinguishing" the mechanics of war logic and after the maintenance " That is "the notion of prevention". He admits then that: "Most of the lectures are on genocide, the 80% of the subjects is mainly centralized on the victims, and few notions on the prevention. 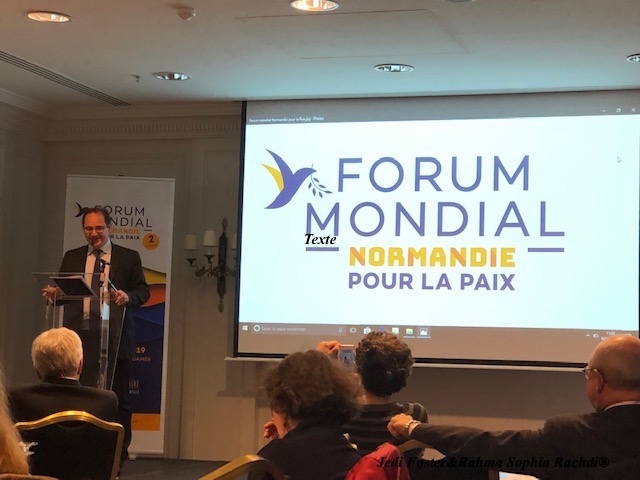 Hubert Vedrine explains why he is happy to contribute to this forum of peace Normandy that he considers quite unique in the world: "I bring my contribution with pleasure and the round tables are very close, it will take a thread to know what is this link, which is the only initiative that does not exist anywhere and hence my participation. " Bertrand BADIE, Bertrand Badie (born 1950) is a French political scientist and international relations specialist specialist, emeritus professor at Sciences PO. He is one of the most renowned French specialists in international relations. 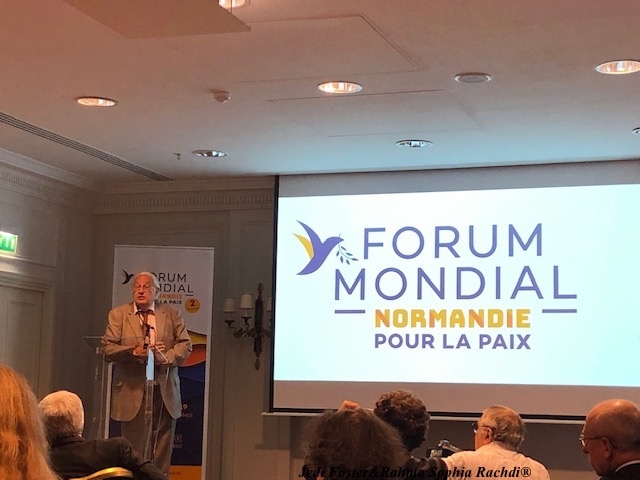 He explained how the World For Normandy For Peace, focused last year on "The nature of conflict" and that this year it will be more "Conflicting contexts today," and that's why it was decided to take an interest in the "PeaceMakers". Bertrand then emphasized the importance of looking at the Peace Makers, excluding diplomacy and NGOs: "Apart from the diplomats still in office, there are the peace makers, and the failures of multi-lateralism, in the games of the powers and veto and blockages. " Bertrand helps adds that "The goal is to promote human security. Peace is not only a balance of powers, UNDP plays an important role WHO, FAO, WFP, and they are peace-makers, we must make international peace in the face of their intervention, they are Peace Makers. The Saint Egidio community was a PEACE MAKER in Mozambique, MSF was Nobel Peace Prize winner. Bertrand Badie, concluded after the change of modes of conflict, linked to the modernity of current technologies "With the new forms of conflictuality, these organizations must play in the role of peace today as was the Red Cross in the 19th century. in Crimea. The share of local authorities, and regions, and cities is also essential. He concludes on a positive note: "It is human peace, and that is why we must rename peace, as an attempt to meet basic needs to reduce the risk of war. 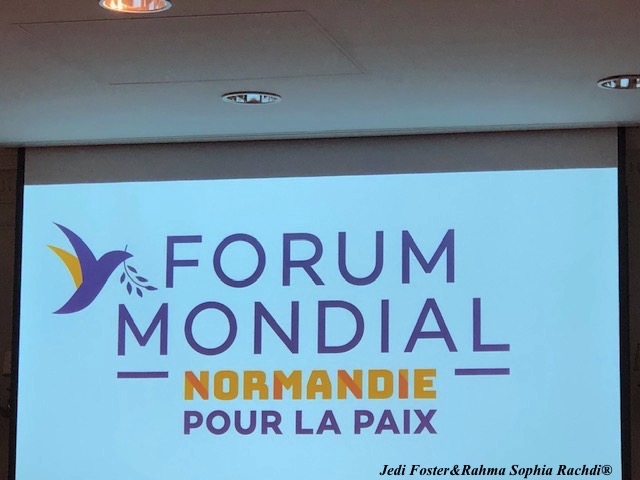 HUMANIZE the world "
THE PRIZE FOR FREEDOM SHALL BE AWARDING YOUNGSTERS AROUND THE THEME THE PEACE MAKERS The second edition of the World Normandy Forum for Peace will be held on June 4 and 5, 2019 in Caen, at Abbaye-aux-Dames, before the commemorations of the 75th anniversary of the D-Day landings on June 6, 1944 and the Battle of Normandy. An annual event open to all, this Forum is a place of reflection and exchange around tensions in the world and peace building. It is led by experts in geopolitics, alongside representatives of governments, academia and civil society. The 2019 World Forum will offer, around the theme "Peace Makers", conferences, thematic debates, a Village for Peace and highlights dedicated to youth, around internationally renowned personalities including 5 Nobel Peace Prize winners. Greta Thunberg, the young Swedish climate activist, as winner of the Freedom Award. Greta Thunberg was chosen as the winner of the Freedom Award by 15- to 25-year-olds, following an online vote from March 1 to 31, 2019, with 41.67% of the vote. 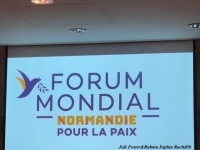 The award ceremony will be held on June 5, 2019 at the Abbaye aux Dames in Caen as part of the World Normandy Forum for Peace and the 75th anniversary of the Normandy Landings in the presence of veterans. FRANCOIS XAVIER PRIOLLAUD, VP OF NORMANDY REGION THINKS PEACE IS A REASONABLE DESTINY FOR HUMANITY Francis Xavier PRIOLLAUD, VP Region Normandy, as for him declines the three particularities of World Forum Normandy for Peace: "Normandy is attached to the notion of freedom and Peace, and the three particularities of our forum are: 1- Youth, It is important to raise the awareness of young people and because a thousand young people participate in the Walk program and raise awareness among future decision-makers. 2- The Alchemy to meet around a common goal by multidisciplinarity, work and reflect on peace in geopolitics but also philosophy, literature and contribution of writers on peace. Francois Xavier Priollaud, reminds the importance of the media and warns about the diversion of the media, like the "fake news", because they are a destabilizing factor. True media can be wrong about peace with fake news. 3- Who are the PEACE MAKERS of today and tomorrow? The Vice President of the Normandy Region asks the essential question: "IS PEACE THE REASONABLE DESTINY OF HUAMNITE? As Francois Xavier Priollaud puts it, "This forum is a long-term one, last year's successful experience that exceeded our hopes and essences on an international level. He recalls the coincidence of the celebration of the 75 th anniversary, June 6 with the WFNP, which will be two great moments with three plenary sessions. According to the guiding thread of the three plenaries, will give the tone of the intellectual progress, to advance on the following thermals: 1- Who are the peacemakers? June 4th 2- Paths of Peace 100th anniversary treats of Versailles June 5 3- Build a lasting peace 5 June afternoon The three plenary sessions as well as the six major debates possible with fifty participants, in parallel will bring together speakers with researcher profiles, NGO leaders, media journalists, and / or scientists, in front of the public, not to mention the intervention surviving veterans on June 5th to mark the celebration of the 75 th anniversary of the American landing in Normandy during the Second World War ..
YAK, Yacid Ait Kaci tells us how the jury he has presided over to put the PIX DE LA LIBERTE, has young people of 15/25, who sent. The nominations were numerous and the session provided, 113 files received and the sorting retained, 93 files submitted to the Jury Meeting chaired by AK in February. “ The finalists were chosen by consensus by young judges from four continents. They exemplify the fight to defend freedom, particularly freedom of expression. We also wanted to highlight the digital aspect, which helps to spread messages across the globe” says YAK, who presided over the panel of judges for the Freedom Prize. 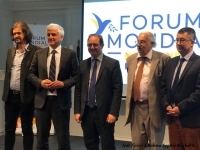 The Freedom Prize was created by the Normandy Region, in partnership with the International Institute of Human Rights and Peace, academic authorities, Canop. and Ouest-France. THE THREE FINALISTS OF THE FREEDOM PRIZE: • Raif Badawi, a 35-year-old Saudi blogger, for his fight for gender equality, freedom of conscience and expression. Accused by the Saudi authorities of having insulted Islam, he was sentenced in 2014 to 10 years in prison and 1,000 lashes. He was forced to suffer 50 lashes in public before the application of this sentence was suspended. He is still in prison. • Lu Guang, a 58-year-old Chinese photojournalist, for his fight to expose environmental destruction caused by industrial development and the Chinese government’s desire for growth at any price. He disappeared on 3rd November 2018 in the Xinjiang province in the north-west of China. His relatives were informed that Lu Guang had been arrested by Chinese police in early December but have heard nothing more since then. • Greta Thunberg, a 16-year-old Swedish secondary school student, for her fight against the inaction of the heads of state and the government and the lack of awareness of the climate emergency. She misses school every Friday to protest in front of the Swedish Parliament in Stockholm. Greta Thunberg rose to prominence after speaking at COP24 in December 2018 in Katowice (Poland) and the World Economic Forum in Davos (Switzerland) at the start of 2019. The Freedom Prize gives young people aged 15 to 25 from all over the world the opportunity to choose an exemplary public figure or an organisation, committed to the fight for freedom. For this first edition, an international panel of judges, led by the newspaper cartoonist YAK(*), chose three finalists from more than a hundred nominations received from all overFrance and around the world. The nominees are: Raif Badawi, Lu Guang and Greta Thunberg. The winner of the first edition of the Freedom Prize will be decided by an online vote, open to young people aged 15 to 25, from 1st to 31st March 2019. The Freedom Prize award ceremony will be held on 5th June 2019 in the Abbaye-aux-Dames in Caen, as part of the events for the 75th anniversary of the Allied landings in Normandy, and will be attended by veterans. The winner will receive a cheque for €25,000 and a trophy created by the final-year applied arts class, specialising in woodworking, at the Lyc.e Augustin Boismard de Brionne in the Eure department.